TAMPA, Fla. -- Jeannese Castro pulled up her electric blue Toyota Yaris to the chain-link fencing bumping against the property at Mann-Wagnon Park in the heart of Sulphur Springs. As soon as she put it into park, several energetic girls scrambled out, talking and playfully shoving each other as they walked up to the entrance to the Moses House. Here, kids in the community come after school for tutoring sessions, art workshops and just to hang out, an alternative to hanging out on the streets of one of Tampa’s most impoverished neighborhoods. The kids are sweet and smart, volunteers at Moses House always say, but rough around the edges. Castro is here to give them a role model, an adopted sister and a friend. Castro, an anthropology student at the University of South Florida, began her volunteer work for Moses House last spring for Lance Arney’s Urban Life and Culture class. As a service-learning course, Castro was required to complete a service learning project with a community partner and students were encouraged to do so in Sulphur Springs. 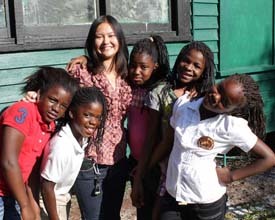 Castro helped design a girls’ program for the Moses House, an organization that did not have a physical location until April 2010, four months into the course. Programs were previously held at Sulphur Springs Elementary and at the local YMCA. She and a few other students researched similar programs at other outreach organizations and then designed a program that addressed issues of self-esteem, body development, personal relationships, the importance of education and discrimination, among other topics. When the class ended and the pull of summer began luring most of the students away from the volunteer work, Castro continued to spend time with the girls at Moses House. Castro seems timid at first but people are quick to realize that she is just quiet until she feels the need to speak up. She has no problem handling the rambunctious younger girls. Castro’s positive qualities are a given at the Moses House. After all, she’s Jeannese. Everyone loves her. Because the girls were not able to get rides, Castro had no problem picking them up and bringing them over. Castro had brought her photo album of fond memories of a childhood in Sulphur Springs. Low real estate prices brought her family to the neighborhood and for 11 years, she went to the same schools and recreational facilities that these girls use. “I sure did,” Castro said. The kids grouped together, peering over Castro’s shoulders to see her photos. The girls identified many of the classrooms and the places Castro had taken pictures of. Castro not only learned about some of the history of Sulphur Springs but is herself contributing to the preservation of it. Over the summer, she took Research Heritage USA with Antoinette Jackson, an anthropologist who has been actively involved in Sulphur Springs to create a museum that will eventually house artifacts and exhibits from the area before the heritage and history is lost. “We never learned about the history of our community at Sulphur Springs Elementary so I think it’s important that we teach the kids today who live in Sulphur Springs that their community is filled with interesting history that is well worth preserving,” Castro said. Castro’s research focused on the types of foods eaten in Sulphur Springs’ past, and how these foods were obtained. She emphasized specific locations like grocery stores and restaurants, the Hillsborough River, gardening and the Bottom. Comparing the types of food eaten in earlier times and methods of getting the food shows how people’s lifestyles have changed over time. Her research, along with that of other USF students, is currently the focus of the first couple of exhibits for the museum. “It makes me really happy that I can give back to the community I grew up in,” Castro said.